The door beeps, and a woman enters. She scans the shelves of accessories looking for something specific. Approaching the counter, she asks about thin leather bracelets for her husband. Tim Huth, One Love Yoga & Boutique owner, replies that they are sold out, and he picks up their display rack behind him. He immediately calls his daughter. 20 minutes later another beep sounds as April Huth, One Love Yoga & Boutique owner and manager of retail operations, enters through the backdoor, bracelets in hand. The daughter and parent team of April, Tim and Pam Huth opened this yoga studio and store in Kent, Ohio in 2013. Growing up, April’s dream was opening a store with her parents. She planned to name it “Three Little Birds” because it has always been the three of them. After graduating from Kent State University in 2011 with a fashion merchandising degree, April went to work at Nordstrom. One day at work April was helping one of the downtown Kent developers. He was at Nordstrom looking for a coat and asked about April’s career aspirations. She shared her dream of owning a boutique, and he offered her a space downtown. April didn’t have the financial resources to open a boutique, but she did mention her father was looking to open up a yoga studio. April and Tim became certified yoga instructors in 2011 and both teach at One Love Yoga and work in the boutique. 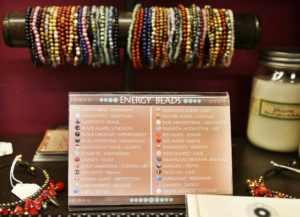 The boutique sells yoga accessories, necklaces, headbands, candles, figurines and yoga books. The clothes can be mixed and matched into the fashion trend athleisure, which combines athletic clothing with traditional daywear. Everything the boutique sells is eco friendly, made in the U.S.A. or fair trade. Being aware of one’s environmental impact is important to One Love Yoga. “If you care about the environment, other people or whatever you care about, it’s important to also reflect that in the things that you purchase and the things that you wear.” April said. When One Love first opened, April could only order from a few brands. Ordering sustainable merchandise still takes a lot of work, but the number of sustainable brands One Love carries has increased. Sustainability in the fashion industry started gaining importance around the start of the 21st century, but fashion designer Katharine Hamnett started bringing attention to it in the 80s and 90s, says Noel Palomo-Lovinski, Kent State fashion professor who teaches sustainability in fashion. The fashion industry needs to make many improvements to become more sustainable. These improvements involve the amount produced, the kinds of fabrications, the price of production, the kinds of chemicals and dyes used, the fibers used to make fabric and the life span of products in addition to where, how and the conditions of manufacturing. Palomo-Lovinski believes sustainability is the future of fashion. 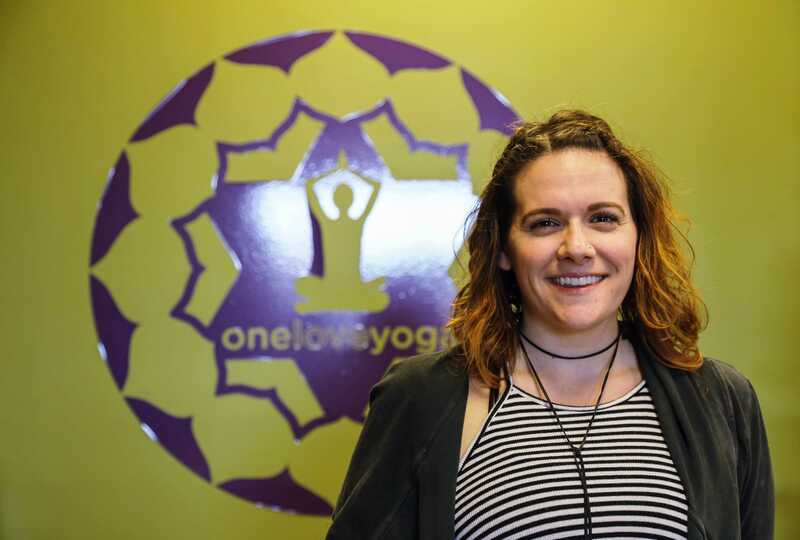 One Love Yoga also offers internships to KSU students. Currently they have four interns who are not paid, but are compensated with free yoga. They work in the boutique to check customers out, check in yoga students, register students and help with marketing strategies and social media accounts. Interns also help organize store layouts and select merchandise. One of these interns is Ali Reich, a junior fashion merchandising major at Kent State. The internship at One Love Yoga & Boutique made sense to Reich because it combines activity, sustainability and fashion. Three things she is passionate about because of her active lifestyle, her desire to positively impact the environment, her major and her love of athleisure. It also gives her small business experience as one day Reich would like to own her own business. One Love Yoga has two locations in Kent; the studio and boutique on Water Street and the Silk Mill across the street from the Kent Free Library. The Silk Mill was originally Kent Yoga, but on Jan. 1, 2016, it became One Love Yoga’s second studio. Kent Yoga was going out of business and offered gentler yoga practice, while One Love Yoga wanted to continue to serve those students. The downtown studio is heated and provides a vigorous yoga practice, and the Silk Mill continues to offer gentler classes. Last year the Yoga Alliance reported over 36 million people are practicing yoga in the United States, an increase of over 16 million from 2012 in a study done by Ipsos Public Affairs. Yoga Alliance is the largest international nonprofit association representing the yoga community. There are several types of yoga in the yoga industry, and it’s unpredictable to know how long the trending yoga will be trending. Elements of yoga philosophy are community and giving back. One Love Yoga tries to sell as many locally made products as possible, in addition to supporting other local business by having local business cards on display and donating to local charities. A blue mason jar with a Kent State Flash-A-Thon sign is also on display asking for penny donations for Akron Children’s Hospital. One event they participate in is the For the Love of Fashion. The annual fashion show features downtown restaurants and boutiques, and it benefits one of Kent State’s sororities. This year’s fashion show happened on Feb. 10 in the Kent State University Hotel & Conference Center and donated its proceeds to Alpha Xi Delta’s Beta Tau Foundation benefiting Autism Speaks.